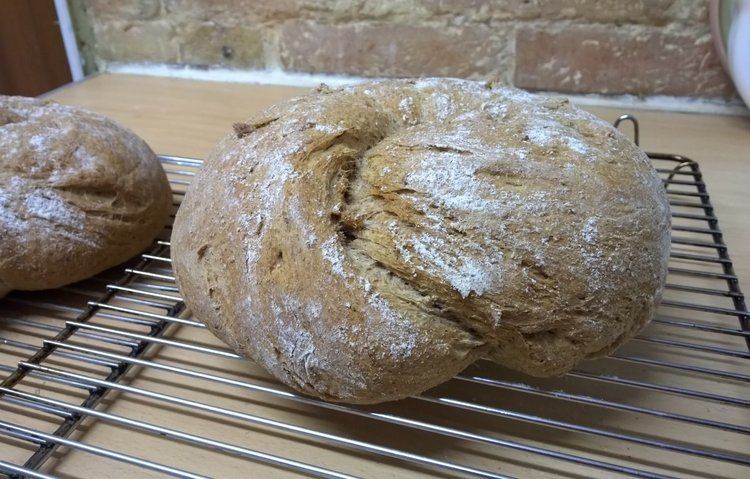 I used a recipe from Paul Hollywood for this bread, although I doubled the quantities to make two loaves. As you can see from my picture, it comes out looking lovely and rustic, and the inclusion of a little white flour in the dough keeps it light. 1. Place the flours into a large mixing bowl and add the salt to one side of the bowl and the yeast to the other. 2. Add the butter and three quarters of the water, and pull the mixture together with your fingers. Add water a little at a time until you’ve picked up all the flour from the sides of the bowl. You may need more or less water, so just keep adding a little at a time until your dough is soft but not soggy. Keep going until you have a rough dough. 3. Brush your work surface with a little olive oil, and knead the dough on it for 5–10 minutes until it becomes soft and smooth. Place it into a lightly oiled large bowl. Cover with a tea towel and leave to rise until doubled in size which will take at least an hour. 4. Line two baking trays with baking paper. 5. Dust your work surface lightly with flour and tip the dough onto it. Knock the air out of the dough by folding it inwards repeatedly until it is smooth. Divide the dough into two and shape each one into whatever loaf shape you would like. With each of my two, I rolled it into a sausage shape about 40cm long, crossed the ends, and pulled the top one over and up through the middle, like the first half of tying a bow. Then tucked the ends and pressed and turned around the edges to end up with a roughly round shape. 6. Put the loaves on the baking trays and cover with cling film. Leave to prove for about an hour, until the loaves have roughly doubled in size. 7. Heat the oven to 430F/220C and place roasting tray in the bottom to heat up. 8. Rub flour all over the proved loaves. Put the loaf into the oven and fill the roasting tray with hot water. This will create steam in the oven while they cook. Bake the loaves for 30 minutes, then check they are cooked by tapping the base which should sound hollow. Oh this looks so good. I wish I had the patience to make bread, but I suppose it’s just as well I don’t. I’d eat it all the time if I did. Luckily, we have a market near us that has wonderful fresh bread when I want a loaf for dinner. No, you have enough already. I’m not a sharing sort of person anyway. I love fresh-baked bread, and this looks wonderful. The weather’s cooling down, and that’s the perfect time to do some baking…. Absolutely and you get a bit of a workout with all that kneading!